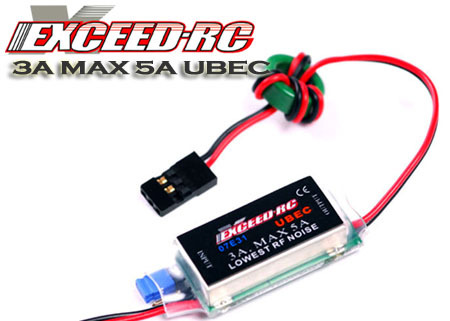 The 3A-UBEC is a switch-mode DC-DC regulator supplied with a 2-6 cells lithium battery pack (or 5-18 cells NiMH /NiCd battery ), it outputs a consistent safe voltage for your receiver, gyro and servos. It is very suitable for RC helicopter. Compared with the linear mode UBEC, the overall efficiency of the switch-mode UBEC is much higher. 2.2 The output is powerful even working with 4 to 6 cells Lipo battery. 2.4 A metal shield covers almost all the electronic components, and a specially made filter is attached with the output wires to significantly reduce the electromagnetic interference. 2.5 The working status is shown by an indicator (LED), lights when the output is in normal range.